Fortunately, the level is very low. 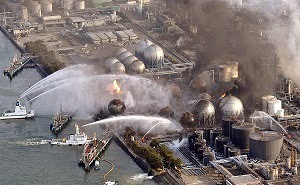 Seaborne radiation from Japan's Fukushima nuclear disaster has reached North America. Scientists at the Woods Hole Oceanographic Institution detected small amounts of cesium-134 and cesium-137 in a sample of seawater taken in February from a dock on Vancouver Island, British Columbia. It's the first time radioactivity from the March 2011 triple meltdown has been identified on West Coast shores. Woods Hole chemical oceanographer Ken Buesseler emphasized that the radiation is at very low levels that aren't expected to harm human health or the environment. "Even if the levels were twice as high, you could still swim in the ocean for six hours every day for a year and receive a dose more than a thousand times less than a single dental X-ray," Buesseler said. "While that's not zero, that's a very low risk."